I have a love-hate relationship with Lily of the Valley. I know those seemingly innocuous flowers that have delicate sprays of tiny bells - and I am surprised that someone has not written a fairy tale about how those "bells" came to be - how could anyone not just love, love, love them? Well I love the flowers and maybe even the green leaves for the first few weeks in May and then I realize that they are about to take over and destroy every other plant within in "ringing" distance. Loathed in the garden, perhaps - but loved in lace. 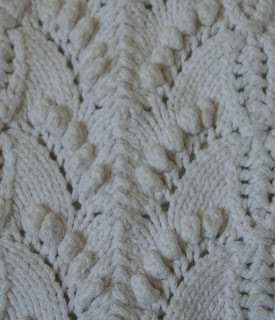 Some of the most exquisite lace is based on the Lily of the Valley stitch. I have the book Knitted Lace of Estonian and let me tell you, if I could find a way to create a nupp that doesn't require micro-surgery on the return row, I would knit Lily of the Valley forever. Many designers have obviously mastered the art of the nupp and have gone on to create timeless pieces. I am still back at the "starting post" or "casting on post" - but I am working on it!! 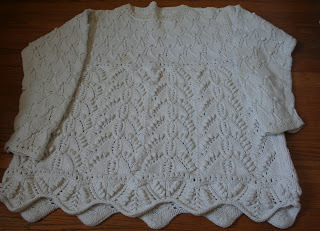 So although Lily of the Valley may be an invasive garden species - it hasn't as yet invaded my lace designs - but for a nupp the shawl was lost - or something like that. Actually I did try some Lily of the Valley in DK. I didn't do the nupp - just a bobble and designed this. Here's a close up of the stitch. 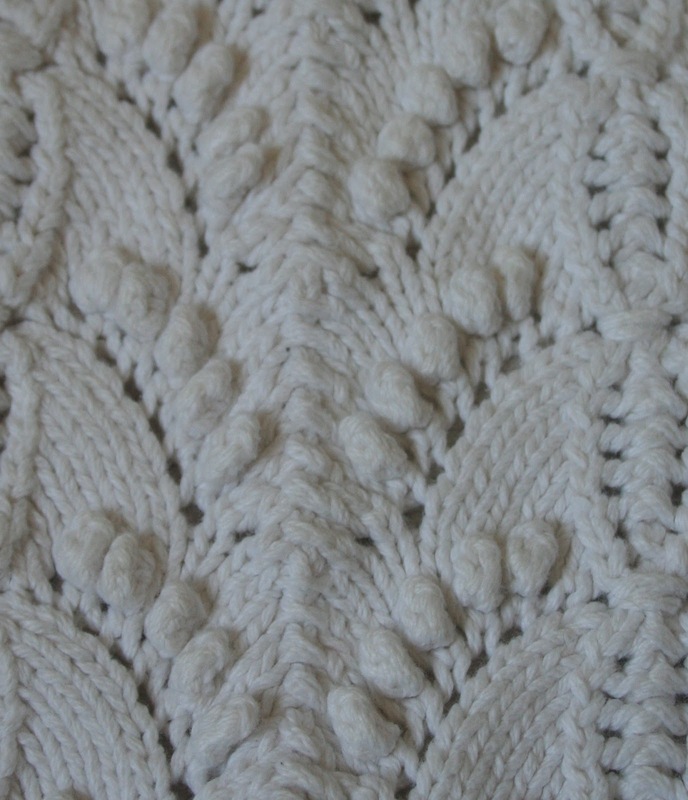 Actually it looks a lot better in lace; but I knit the sweater about 15 years ago - way before I ever dreamed that I could knit lace. Anyway, back to the garden variety of Lily of the Valley - my neighbour calls them - divorce material - it seems that L of V is the only plant that her husband can grow and she is "forbidden" to dig them out. So there are stories here - Lily of the valley stories. Can't wait until I'm 104 years old!! !